FRENCH LICK, Ind. – Lorie Kane let a victory slip away on the LPGA Legends Tour two weeks ago when she lost in a five-hole playoff to Rosie Jones in the Harris Charity Classic in Maine. There was no such negative carryover to Sunday when Kane put herself in position to win again, however. The Canadian golfer put a 40-foot chip shot to within two inches of the cup on the final hole for the birdie she needed to bag the biggest title in the history of the 13-year old circuit for LPGA players who have reached their 45th birthday. 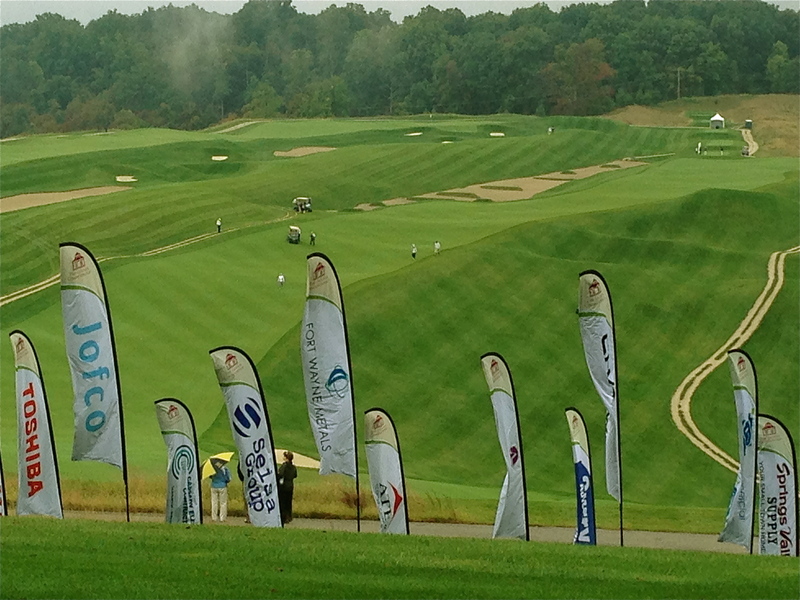 All the players endured strong winds (which had the sponsors’ banners blowing, photo below) and day-long rains before Kane won her title. Kane and playing partner Laurie Rinker started the round tied for the lead at 3-under-par with Val Skinner, the only other player in red numbers, another shot back. Skinner hooked her first tee shot into a hazard, setting the stage for an opening bogey that kept her chasing the co-leaders the rest of the way. Kane opened a two-stroke lead on the front nine, then gave it back with bogeys at Nos. 13 and 14. That set the stage for a dramatic finish at the finishing hole, a dogleg par-5. A 25-foot birdie putt pulled Skinner to 2-under and within a shot of the leaders as Kain and Rinker prepared to hit their second shots to the green. Rinker hit her second shot thin and her third short of the green. She wound up with a bogey after Kane notched her birdie to finish at 3-under-par 213. The bogey dropped Rinker into a tie with Skinner, two strokes behind the winner. The first LPGA Legends Championship, staged on the Pete Dye Course at French Lick Resort, had the most players (58) and the biggest purse ($500,000) in the circuit’s history. Kane claimed the biggest prize — $60,000 – for winning the only 54-hole event of the season. Her only previous Legends win came in a one-day tourney. Not everyone agreed. The Dye Course was brutal in Sunday’s conditions. A steady morning rain required the lift, clean and place rule to be put into effect and misty, cold, windy weather was prevalent throughout the day. Only fourth place Laura Davies (1-under 71) bettered par in the final round and Kane and Trish Johnson, who finished in a tie for ninth, matched it. Kane hadn’t played in weather like that since last year’s Women’s British Open. Kane has struggled on the LPGA circuit and plans to improve her status at the fall qualifying school after competing for the World team in the Legends’ Handa Cup event in Nashville, Tenn. The LPGA Legends Championship is scheduled to be played on the Dye Course the next two years and the Legends Hall of Fame at the nearby West Baden Springs Hotel will be completed in time for next year’s event, tentatively planned for August. Another women’s competition, the Big Ten Championship, will be played on the Dye Course in May. It has been held at French Lick’s Donald Ross Course the last two years.